Tell us about the trip you went on. 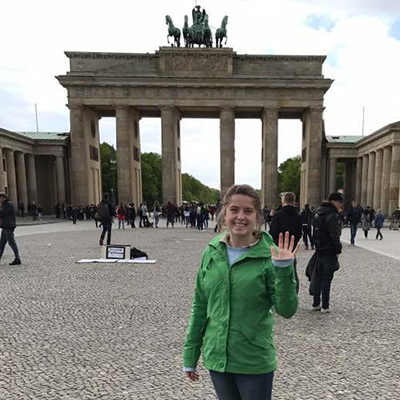 I traveled to Berlin, Germany as a part of the “Berlin Then and Now: People, Places, Experiences” Maymester study abroad program. This course focused on Berlin as a source of history and culture, and the effect of the past on Germany’s present. Coming into this program, I didn’t know how to speak German, and most of my historical information about Germany came from my knowledge of the world wars. Needless to say, I didn’t know what to expect from my time abroad. I was pleasantly surprised by how much I learned from this experience! I knew that I would definitely learn some historical events and dates, but what I didn’t expect was how learning about another country would broaden my worldview, and make the world itself seem more accessible. I enjoyed almost every excursion on this trip, from the Berlin Wall Memorial, to the Berlin Variety show, to the tour of Parliament, to the German modernist theatre, to Sanssouci palace, to the taz newspaper. I learned the dates and historical background of important historical events, like the Berlin Wall and Separated Germany, the Holocaust, and the reign of Frederick the Great. I had a vague understanding of most of these evets, but this trip made them tangible. Learning about history while in Germany encouraged a new perspective. But this trip was so much more than seeing historical buildings or recounting history. I felt like each tour we took, and each place we visited, served as a call to action. Not only did I learn about German historical events, but I began to understand how events in one country can influence people who are multiple countries or even oceans away. Every time we visited a museum or memorial, we were reminded not only of the past, but how the past has continued to affect the future of German citizens and citizens of the rest of the world. I found many more parallels than I expected between German and American social issues. This trip broadened my perspective from the United States, to consider how our decisions affect the rest of the world and how we are effected by other countries as well. That is how this trip has changed me; it has called me to pay attention to what goes on in the rest of the world. It has called me to speak out about issues that matter to me because history has shown us what happens when people remain silent. This trip has helped me remember that I am a citizen of not just the United States, but of the world, so we should always consider how we interact and impact those outside of our borders.